Can Touch 'n Foam be used to air seal a wall? If the foam has not cured (it is still moist), it may be removed by wiping off with a dry cloth, or by using acetone or nail polish remover containing acetone. Do not use soap and water as moisture helps to cure foam. No solvent will remove cured (dry) foam. Cured foam is not harmful to health and will wear off in time. A pumice stone with warm, soapy water may be used to gently scrape dried foam from skin. You may also apply petroleum jelly to area and cover with a plastic glove, wait about an hour then wash area with soap and water. Yes. Touch 'n Foam sealants meet the criteria of flame / smoke spread to be classified as a Class-1 foam. While these sealants are fire retardant (self-extinguishing when flame is removed), they are not intended to be used a fire barrier or fire stop. Touch 'n Foam sealants are water-resistant and form an airtight seal when applied properly. A can may be re-started for up to three weeks if it has been stored properly with the straw still attached to the adapter and can. Simply bend the straw back and place the straw tip on the plastic nub at the top of the trigger adapter. 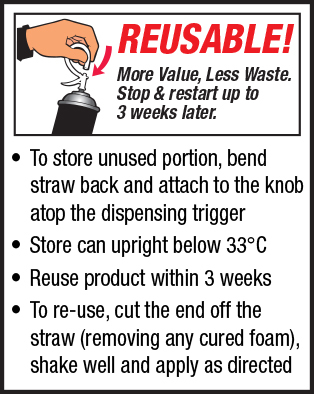 To re-start, cut the end off the straw (removing cured foam), shake well and follow the application directions on the can. Touch 'n Foam makes a full line of sealants that can be used all around the home to stop air leakage and drafts. Use around windows and doors, plumbing fixtures, electrical outlets (around, not inside, junction boxes), baseboards, sill plates, exhaust vents, siding edges, sky lights, attic fans, garage ceilings, etc. Review our Uses for Foam and Energy Saving Tips pages for more ideas. Touch 'n Foam sealants are manufactured to be upper-ozone safe and environmentally friendly. Use black LandScape foam for exterior uses such as koi ponds when you need a plant and fish safe foam. For best results, the can should be at room temperature with an ambient temperature between 60°-100°F (16°-38°C). HomeSeal has the ability to cure in both higher and lower temperatures. Polyurethane foam sealants require some humidity to be present in order to cure properly. Touch 'n Foam MaxFill and HomeSeal formulas may also be used indoors or outdoors. These foams should be painted when used outside in order to prevent discoloration and break down from UV exposure. Foam can be painted in about one hour after dispensing. Touch 'n Foam No-Warp, FireBreak and Easy Fill should be used indoors only. Touch 'n Foam sealants do not contain any nutritive value and provide an effective barrier against insect and pest intrusion; however, some persistent pests may chew through cured foam.